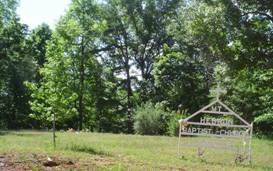 This cemetery, in western Lauderdale County, is located off County Road 21 north of Waterloo, Alabama. From Waterloo, travel north on County Road 14 1.07 miles and turn right onto County Road 90. Go approximately 2.2 miles to County Road 21. Turn left and keep right, following CO. Rd. 21 2.23 miles. The cemetery is across another intersecting road. This cemetery is very old. Many years ago there was a church here and this enumerator was told that the stone footings are still there a short distance from the cemetery. There are at least 12 unknown graves in this cemetery. 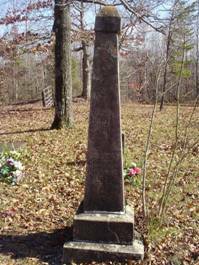 West side (opposite grave): Our darling Vilena, daughter of J.H. & S.A. McClusky, born October 7, 1911, died February 26, 1923. To know her was to love her. South side: Friends, Kindred, meet me there. North side: Born 3 miles east of Tuscumbia, Ala.
McClusky, Vilena; b. 07 Oct 1911, d. 26 Feb 1923, daughter of John H. & Sallie A.
McClusky, Sallie A.; b. 1871, d. 1927, wife of John H.